SAN JOSE, Calif.--(BUSINESS WIRE)--Jul. 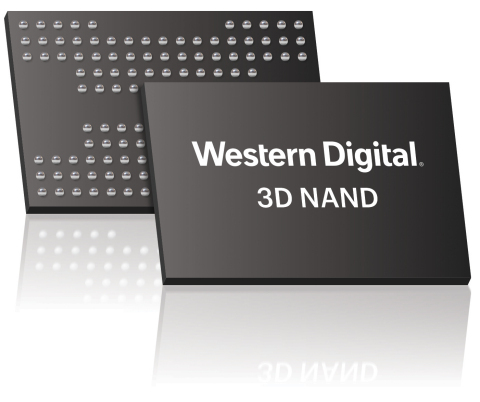 19, 2018-- Western Digital Corp. (NASDAQ: WDC) today announced successful development of its second-generation, four-bits-per-cell architecture for 3D NAND. Implemented for the company’s 96-layer BiCS4 device, the QLC technology delivers the industry’s highest 3D NAND storage capacity of 1.33 terabits (Tb) in a single chip. BiCS4 was developed at the joint venture flash manufacturing facility in Yokkaichi, Japan with our partner Toshiba Memory Corporation. It is sampling now and volume shipments are expected to commence this calendar year beginning with consumer products marketed under the SanDisk brand. The company expects to deploy BiCS4 in a wide variety of applications from retail to enterprise SSDs. Financial and investor information is available on the company's Investor Relations website at investor.wdc.com. Western Digital, the Western Digital logo, and SanDisk, are registered trademarks or trademarks of Western Digital Corporation or its affiliates in the U.S. and/or other countries. All other marks are the property of their respective owners. © 2018 Western Digital Corporation or its affiliates. All rights reserved. This news release contains certain forward-looking statements, including statements concerning the expected availability, benefits, features, pricing and performance of Western Digital’s 1.33 terabit, four-bits-per-cell, 96-layer 3D NAND device. There are a number of risks and uncertainties that may cause these forward-looking statements to be inaccurate including, among others: volatility in global economic conditions; business conditions and growth in the storage ecosystem; impact of competitive products and pricing; market acceptance and cost of commodity materials and specialized product components; actions by competitors; unexpected advances in competing technologies; our development and introduction of products based on new technologies and expansion into new data storage markets; risks associated with acquisitions, mergers and joint ventures; difficulties or delays in manufacturing; and other risks and uncertainties listed in the company's filings with the Securities and Exchange Commission (the "SEC"), including the company's Form 10-Q filed with the SEC on May 8, 2018, to which your attention is directed. You should not place undue reliance on these forward-looking statements, which speak only as of the date hereof, and the company undertakes no obligation to update these forward-looking statements to reflect subsequent events or circumstances.